I have posted potato sandwich long time back. This is another simple potato (aloo) sandwich prepared with boiled and mashed potatoes. If you have leftover boiled potatoes, you can make this sandwich in a jiffy. 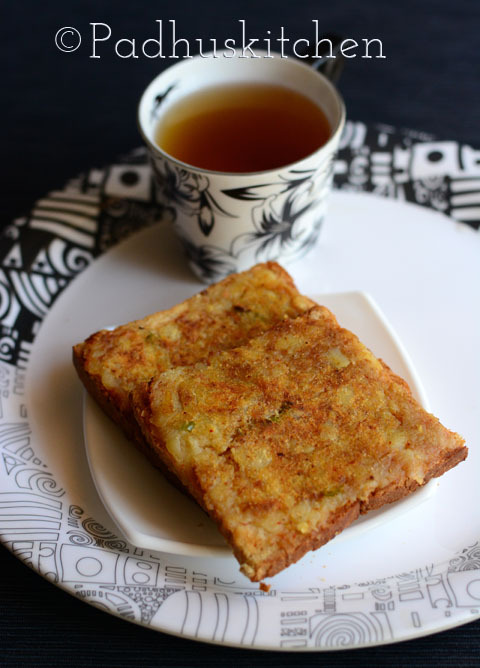 It can be had for breakfast or as a tea time snack. 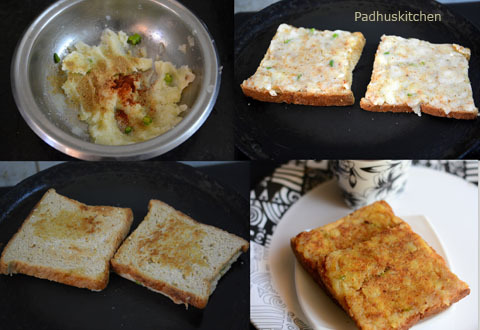 Learn how to make potato sandwich following this easy recipe with step wise pictures. Pressure cook potato until soft. If you already have boiled potatoes, then you can use that. Mash the potatoes well without lumps. Add 2 tsp of water and mash it again to a smooth paste to make spreading easier. Add finely chopped green chillies and all the spice powder. Add salt to taste. Taste and adjust seasonings. Butter one side of the bread. On the other side apply the prepared potato paste. Heat a tawa, toast the buttered side first until golden brown. Drizzle or apply little melted butter or ghee (clarified butter) on top of the potato paste and then flip it over to the other side. Toast the potato side on medium heat until roasted and golden brown. Enjoy hot with tea or even as a breakfast. Its easy and a wonderful dish. Thank u. Of course, you can spread green chutney if you like.